Oregon is well known for its abundant cherry crops, along with our neighbor Washington, and we even invented that weird scarlet orb that is now commonly accepted as the maraschino cherry, a necessity when the country went through that crazy era of Prohibition and the traditional, alcoholic version was excommunicated. Truth be told, I did not like maraschino cherries as a kid. I abandoned them in Shirley Temples or pawned them off on other kids. Nor did I like anything that was cherry flavored – popsicles, lollipops, medicine, blech! – and so I deduced that I simply did not like cherries. Little did I know, “cherry flavor” bears no relation to the flavor of an actual cherry. Go figure! It took some coaxing and a trip around the world to reintroduce me to the naked beauty of a fresh cherry, and awaken a love for the fruit. Which brings me back to the present day, standing before a mountain of red glories, with a smaller, blushing yellow foothill of Rainier cherries* alongside it. As wonderful as fresh cherries are, I knew that I would need to turn a good portion of them into dessert or process them for storage so that none would go to waste. I have had a hankering to make homemade, boozy maraschinos for some time now, so I designated a stack for that purpose, and the rest were bound for an elegant, and incredibly simple French dessert known as a clafoutis (pronounced klah-foo-TEE). In its essence, it involves enveloping the fruit in a simple sweet custard (an egg-milk mixture that solidifies with baking), and requires little more than fresh fruit and basic kitchen staples to put together. Furthermore, it is swift to prepare, and impressive if you’re trying to stun guests with your culinary prowess. 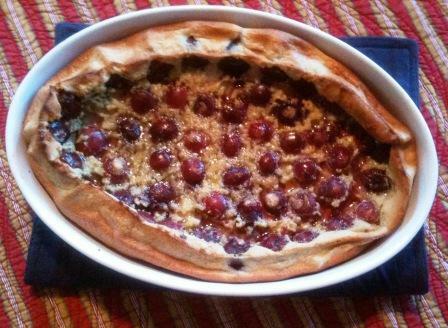 Traditionally, the cherries in a clafoutis are not pitted because the stones are purported to lend an almond-y essence to the dessert. Delicious as that sounds, I opted to nix the pits and use a little almond extract (which is optional) for the sake of comfort and convenience. I guess it’s not very Euro of me, but I like my desserts to be seed-free. And so, I did some research, called around to my local kitchen supply store, and braved (gulp) The Mall to obtain my glorious new gadget — a cherry pitter! — that made quick work of pitting my great volume of cherries. I clamped it to the countertop, the cherries bobbled through the hopper, had their pits skewered out, and tumbled into my waiting bowl. The task can be done with a paring knife, but it will make the whole process more time-consuming. Or let’s call it Zen. To pit them manually, cut around the cherry vertically, twist the two halves apart with your fingers, and then remove the pit from the half that retained it with a twist of your paring knife tip. Not difficult, just incremental. Feel free to experiment with using other fruits as the seasons progress. Things like plums, peaches, and other stone fruit can be substituted easily for the cherries. Many berries (straw-, blue-, rasp-) can release more juices when cooked than stone fruits do, so you may want to make some alterations to allow for that, if you choose to experiment in the berry department. One way would be to use only a portion of what’s left after the maceration stage. (I’d stir the extra into my lemonade. Huzzah.) As usual, I encourage you to use this recipe as a guideline, and make it your own. As I put the finishing touches on this post, I am munching some of the leftovers. Mama mia, it’s even better two days later. What are you doing sitting here on the internet reading about it? Go! Make it! * I saved the Rainiers to munch au naturel. 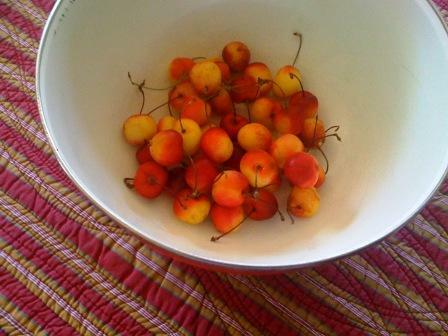 Rainier cherries: as beautiful as they are tasty. Preheat the oven to 400°F, and make sure you have a rack in the center of the oven. Toss your fruit with the 1 T of sugar as well as your booze of choice in a large bowl. (If you choose to omit the liquor, gently toss and mash the cherries a little to get a touch of juice out of them.) Allow this to macerate (i.e. sit around for a while and release some liquid) for about 15 minutes. While you’re waiting on the fruit, generously butter your baking dish. You can also use this time to melt the 3 T of butter and let it cool. Once the fruit is done macerating, use a slotted spoon or your fingers to move the cherries into the baking dish, leaving the juicy-boozy liquid behind in the bowl. Spread the cherries out evenly around the dish. Add all of the liquid ingredients to the bowl (eggs, milk, melted butter, and extracts) and whisk until they’re well blended. Gradually add the salt, 1/2 c sugar, and flour as you’re whisking and mix just until all the ingredients are incorporated, no longer. Pour the batter over the cherries, and slide the pan into the heated oven. Bake for about 35 minutes. The finished product should be puffed up and set in the center. If you shake the pan a little, the middle should not jiggle, but be firm. Change up the fruit and/or booze. Peaches & rum! Strawberries & cabernet! Lingonberries & vodka! Sprinkle with confectioners sugar. Dust it on by putting a tablespoon or so in a small sieve or tea strainer and then shake it over each serving. Eat it for breakfast. Your day will be that much better. This entry was posted on Thursday, July 15th, 2010 at 2:03 pm	and is filed under Breakfast, Dessert, Food, Recipe, Sweets, Vegetarian. You can follow any responses to this entry through the RSS 2.0 feed. You can leave a response, or trackback from your own site. What a nice article. I love clafoutis; one of the less complicated French desserts. I made clafoutis! Left the cherries in because I am lazy. It was delish! So surprisingly simple. Of course I left the cherries in…I meant to say pits.